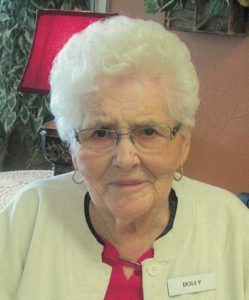 It is with sadness our family announces the passing of Dolly on January 12,2019 at the age of 88 after battling a long illness. She was born in Kamloops to a pioneer family- James Stark McMorran and Dorothy C. McMorran (Edwards). She spent all her life in Kamloops with a long career of 44 years with B.C. Telephone and 33 years volunteering in the gift shop for the Afternoon Auxiliary to Royal Inland Hospital. In retirement her daily coffee visits were spent with many friends and acquaintance settling the problems of the world. She was predeceased by her parents Stark and Dorothy, brothers Melvin, and Elmore. She is survived by her siblings Gordon (Marilyn) McMorran of Victoria, Shirley (Ben)Watters of Kamloops. Nephews and nieces James (Sheri) Watters, Rob (Maurine) Watters, Ron (Laura) Watters, Bev (John) Watson, Shawn (Anna) McMorran, Lori (Tim) Conell. 14 great nieces and nephews. The family would like to express appreciation to long time friends Diana and Norm Kopec for loyalty and friendship. To Heather for her caregiving and wonderful friendship to Doll and her support to our family there are not enough words. We appreciate and thank the staff of Pine Grove Care Home for their care. Dolly enjoyed life and lived it her way and has now earned her wings. I wish to extend my sincere Sympathy in the loss of Dolly… I got to know and love Dolly upon moving to “The Oaks” in 2007. I did see Dolly from time to time as I now reside at Ridgepointe (since 2017) and she ( for some period of time) resided at “The Renaissance “and periodically we would participate in joint affairs. I would see Dolly, but had not seen her since her move to “Pine Ridge”.